Simon's latest Video "Synched Out" Removed from YT !!! Wow! Why? 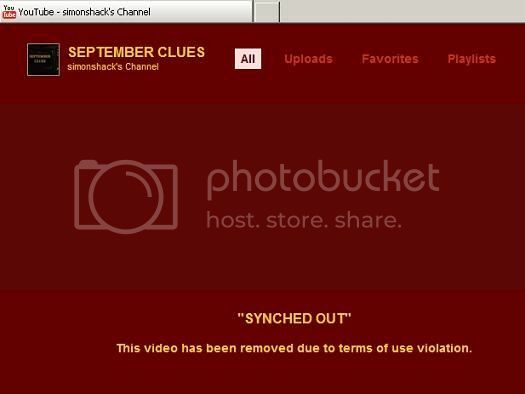 Why did Youtube ban my SYNCHED OUT video twice - and immediately after I tried to upload it the first time on Sept10, 2010 - and then a second time, on Sept 11, 2010? The sitar music was all recorded in my own studio, and was performed by my friend Luca (who has studied sitar in India) - so this can't be a case of music copyright infringement. Nor can it be a case of video copyright infringement - since the 9/11 TV imagery is of public domain (and has been re-published by COUNTLESS private Youtube channels). This is a most absurd and unjustified Youtube censorship - if there ever was one. SYNCHED OUT - banned by Youtube... twice !! So why - pray tell - did Yotube ban/reject my OWN uploads of SYNCHED OUT twice????? Youtube should furnish you with that answer Simon! Someone must have been very sensitive about the contents of that video. My videos usually get pulled cos i'm using copyrighted music. Someone out there is a real zealot. I hope Simon's video pissed all over their 9/11 Parade....at which nobody attended save a few lackeys. As far as I can tell, they don't even remove the video itself if the music is copyrighted, they'll just cut off the audio, so we know that’s not the reason why it was removed, because all of his videos would have been removed by now. Simon should just upload the video without the music like in the blip.tv version. If the video still gets removed then we'll know for sure that it’s being censored. Dcopymope 4 Sep 11 2010, 09:48 PM wrote: Simon should just upload the video without the music like in the blip.tv version. If the video still gets removed then we'll know for sure that it’s being censored. I'll try to upload it again just as it was. I have been trying to submit a counter-notification : Youtube simply doesn't let me do it (due to an area which always remains red although I have compiled it correctly) !!!! Simon, didnt they contact you regarding it's removal? Email them and ask why it was removed!! I just can't find a direct e-mail to them ! Can you? Help! You should upload it at normal speed like the Blip.TV version. Not possible: Youtube won't take videos longer than 10 minutes. "When we remove content for violating our policies, the user who posted it receives a strike. The type depends on the reason for the removal: copyright strikes are separate from community guidelines strikes. In either case, the user is notified via email and via an alert that appears the next time the user logs in to YouTube." Not true, because the video below is over two hours long. It doesn't actually stop you from uploading a video thats more than ten minutes long, it just recommends that you don't. That account was set up in 2006 when you could select the type of channel you wished. A directors account was the one to grab for full length videos! Youtube changed their accounts policies later but didnt downgrade the existing channel holders! Simon, I can't find a contact for YT! i guess they can pass it along to the italian or US people.